Shopping at a Manhattan Kmart with her 8-year-old son Jonathan, Lisa Velez quickly gravitated to the red Lightning McQueen miniature car from Cars 2, the Disney (DIS) sequel. She squeezed the chassis, and the car cheered, "Go! Go! Go!" Velez was hooked. "I think he's funny, serious, scared and he wants to try," she told DailyFinance. Cars 2 doesn't open until June 24, but its toy line is already revving up the summer movie-toy season. 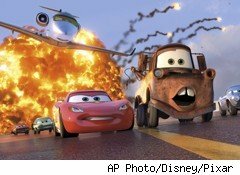 Sales of Cars 2 merchandise will surpass Disney's entire Toy Story franchise within 12 months, predicted industry observer Jim Silver, editor in chief of TimetoPlaymag.com. "It's all about playing cars and the personalities of the cars," he said. Silver said this summer is the most crowded movie-toy field he has seen in the last 25 years. Pirates of the Caribbean: On Stranger Tides, Thor and Kung Fu Panda 2 have already opened, with entries such as X-Men: First Class (June 3),Green Lantern (June 17), Transformers 3: Dark of the Moon (July 1) , Harry Potter and the Deathly Hallows Part 2 (July 15), and Captain America: The First Avenger (July 22) awaiting their theatrical runs. All have promotional toys associated with them -- most in stores already. Disney earned scorn when it tried to trademark "SEAL Team 6" -- the name of the elite squad that killed Osama Bin Laden -- for use in games and snow globes. (Disney eventually withdrew its bid.) But it was a rare misstep for a company that lapped the field last year in merchandising. Disney Consumer Products (DCP), the merchandising arm, amassed a world-leading $28.6 billion in licensed product sales in 2010, a 5.1% increase over its No. 1 $27.2 billion in 2009, License! Global magazine announced in its annual survey. Disney tallied more profit than the next three companies combined -- and the Mouse House's total didn't even include what it raked in from its Marvel superhero stable. Last summer's Toy Story 3 accounted for $2.4 billion, but could be choking on the exhaust of Cars 2 by the time it crosses the finish line. The Cars sequel's subject matter and promotional spin-offs create the perfect marketing storm for children, according to Adrienne Appell, spokeswoman for the Toy Industry Association. The toys "incorporate classic play patterns," she said. "What little boy doesn't love cars?" Even after the original Cars opened in 2006, Disney kept its marketing pedal to the metal to generate more than $8 billion in Cars merchandising revenue through February 2011, the company said. For the sequel, the company unveiled a line of 300 toys. And they're catching the eye of their target market. "From [diapers] to the wallpaper, it's all Cars," Kmart (SHLD) shopper Supreme Pellot said of his 3-year-old son, Bryan. A DailyFinance survey of the Kmart shelves revealed that Disney was winning the affordability race as well. Its lowest-priced movie toy cost less than the competition's -- at least in the store we visited. The Cars 2 miniature cars, including a talking version of Lightning McQueen, was $4.39. A Tigress vs. Gorilla action-figure set from Kung Fu Panda 2 was $5.99. A Green Lantern mask and power ring pack rang in at $7.69, followed by a Transformers 3 Optimus Prime Autobot at $8.79. Once upon a time, back in 1929, Walt Disney licensed the image of Mickey Mouse to appear on a notepad. More than eight decades later, the company still doesn't play around when it comes to merchandising. Said TimetoPlaymag.com's Silver: "They take their properties and transform them into lifestyle properties."